You guys are amazing. What a great crop of captions we had this week. Let's get right down to business. 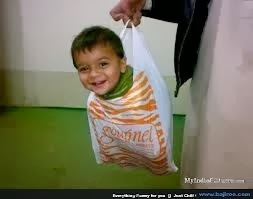 I couldn't help myself -- they had such a good deal on fresh kids at the supermarket today! At the checkout, Marge chose the appropriate bag when asked "paper or plastic?" And I thought the stork brought them. 'whimsical baby' photos to the tabloids. Congratulations, there, Cheryl. 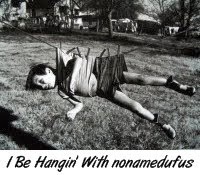 You be hangin' with noname this week! What say we ditch the kid with a view to seeing what develops. I don't mean to be negative but I have no plans in particular. Maybe if we hang out long enough something might come into focus. What do you say? And thanks to everyone who participated for playing along this week. We'll see you Wednesday for another edition of Pause Ponder and Pun. Hee Hee. Great captions! Congrats, Cheryl! Right on, Boom Boom. I kept telling her she could do it. I had to Google Anne Geddes. Great caption! Really, Babs? Cheryl certainly knows who she is. Her baby pictures are amazing. Yo, Mike you gotta get in with your caption on Wednesday, my man. A great winning caption! I'm thrilled to be an Honourable Mention too! Great caption Debra. Today an honourable mention, tomorrow the world! Whee! A win with a photographic reference. Who knew that was even possible? Thanks John. I'll wear this one with pride. You see, Cheryl. Anything's possible if you set your mind to it. Well done. Great captions! Thank you for the mention, Dufus. My pleasure MeMe. Thanks for playing. Hope your cold's better.